I haven’t written a personal post in a long time but as The Wren Design still feels like my baby I feel it is fitting to write and share the birth of my real baby (who is now a month old) and the creative projects that I created in preparation of her. I like mixing old and new. Objects that have meaning and stories and Caroline’s room is full of these. The cot for example is almost 100 years old and almost all of my husband’s family have slept in it. We got it from the family, my god-mom and I cleaned it up and gave it a coat of wax and Jeremy spent hours filing the rust off the metal pieces so that they shine. Above her hangs a mobile that my good friend Alexa bought for her when we were in Amsterdam visiting an art museum. The perfect balance and interplay of these whales are mesmerising. Caroline’s door is guarded by a sweet little bunny that was bought at a local store. It is not extra special but I fell in love with it. It looks more like a seal than a rabbit in some ways and because in the store we could not remember what a seal in Afrikaans is … and seekoiktjie sounded right so it got this nickname. Directly translated a seekoi in Afrikaans is a hippo. 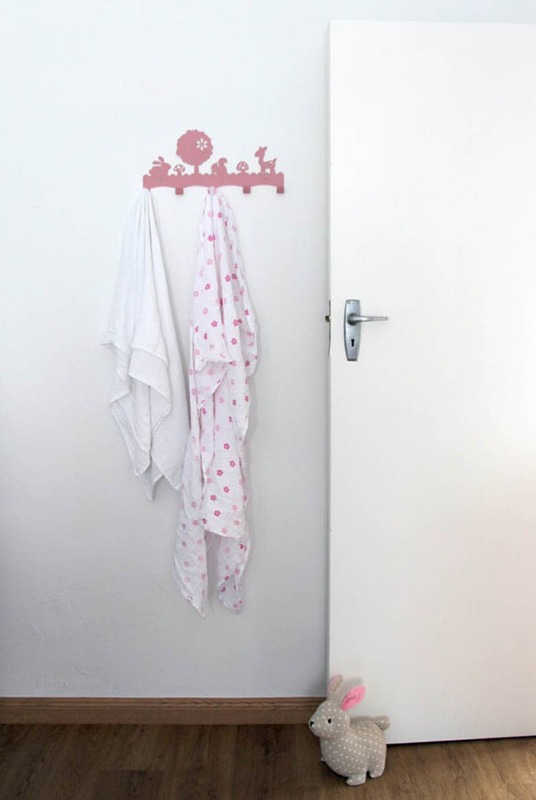 The coat / blanket hanger I bought on etsy. Isn’t it adorable? 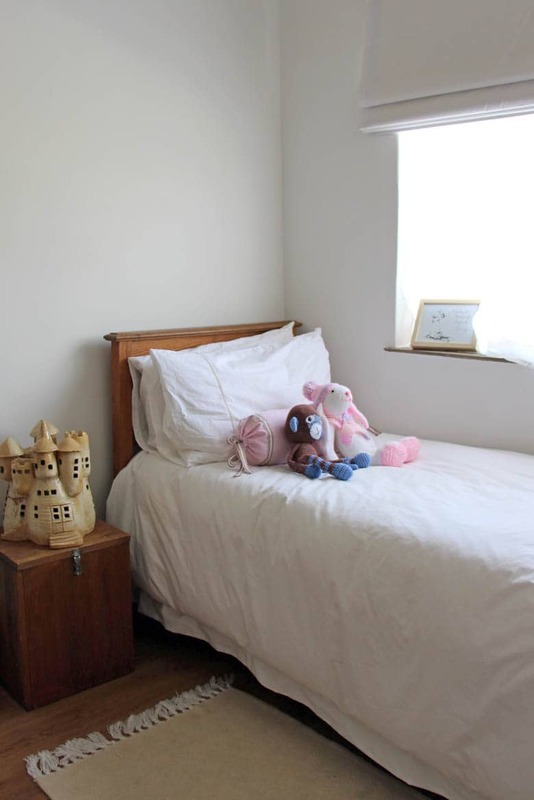 You won’t believe how many blankets and cloths one goes through when a novice parent tries to change a newborn’s nappy! 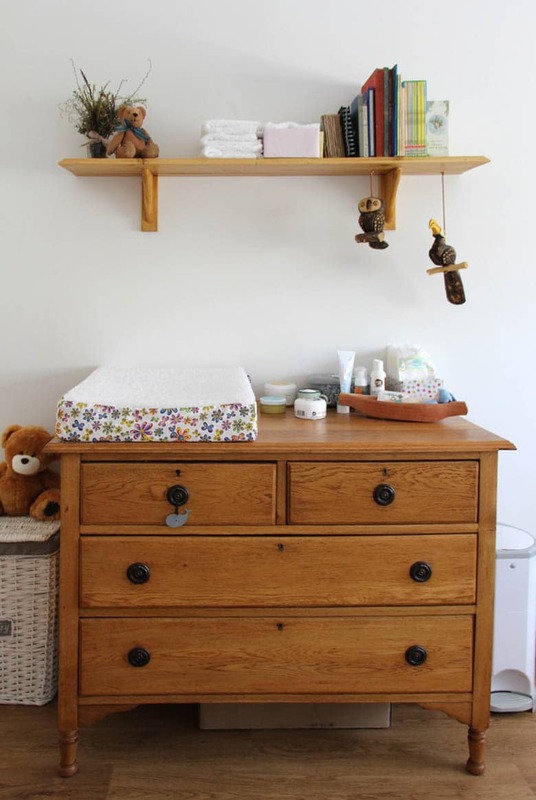 This (above) is our changing table. Instead of spending a lot of money purchasing a compactum we went and choose a beautiful oak chest of drawers. Jeremy added an extension on the back so that it is deep enough to fit a changing mat on. Hanging from the shelf above the changing mat is an Owl and a Hornbill – two wooden carved animals bought at the gates of Etosha during our latest holiday to Botswana, Zambia and Namibia (see blog post). True to me I make a massive task of everything and the drawers were no exception. Each drawer of the “changing table” got lined with beautiful wrapping paper and contact (because I could not find drawer liners that I liked enough). On the table is a changing mat that I made slip covers for and beside them are boxes that I covered with wrapping paper and contact to stack nappies and and face clothes in. Where possible I tried to make rather than buy. 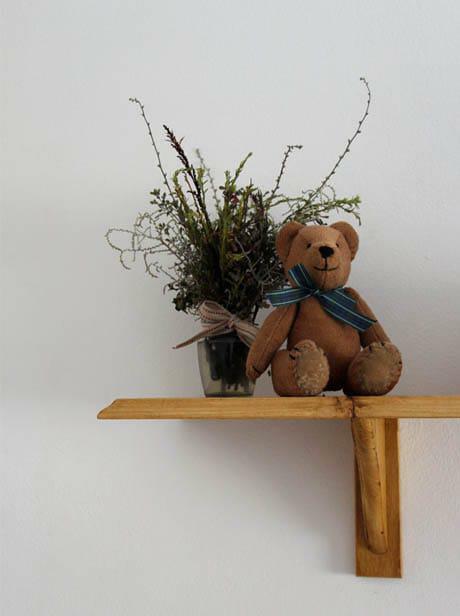 From Jeremy’s family we got this beautiful antique teddy bear and a traditional tussie-mussie for her room. Old school and traditional but I love the combination and still life. This old bed is also almost 100 years old. It is a single oak bed (have you got any idea how hard it is to find a single sheet cover as opposed to a 3/4? I do not think single beds are made and sold anymore!). It is beautiful and dainty, just like our little Caroline. I always said: “one day when I am pregnant I will drawer again”. If I had known how difficult it is to sit hunched over a desk when you are pregnant I might not have made that promise to myself. Nevertheless I am happy that Caroline’s room has something from me > a collection of baby animals drawn using soft pastels. From top left to bottom right: A baby kudu, a baby lion, two young wild dogs and a baby rhino. On the right is a cane rocking chair that my mom and I recovered and gave a new life. What a job this was but the end result is definitely worth it: first we hand tacked foam around the entire chair structure and then cut a pattern for a slip cover to go over. We got a new seat cut out of foam and covered this and in the end we have a chair you would never expect started looking like the one on the far left (below). Sitting in the chair is a owl cushion sewn by my mom (who if you have not guessed by now is quite skilled with her sewing machine), and hanging off the back of the chair is a knitted blanket by my sister. 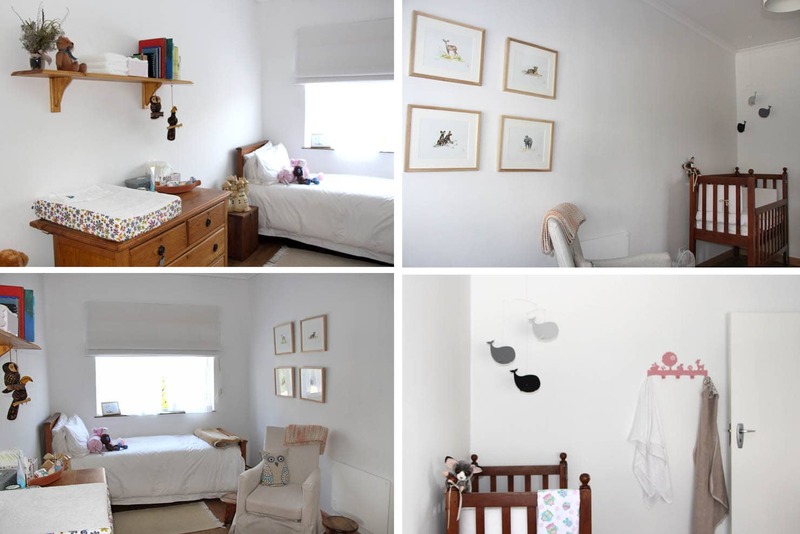 I spent a lot of time trying to make Caroline’s room the nursery I always imagine I would have (adding to Jeremy’s stress as it never seemed ready enough when I was pregnant). 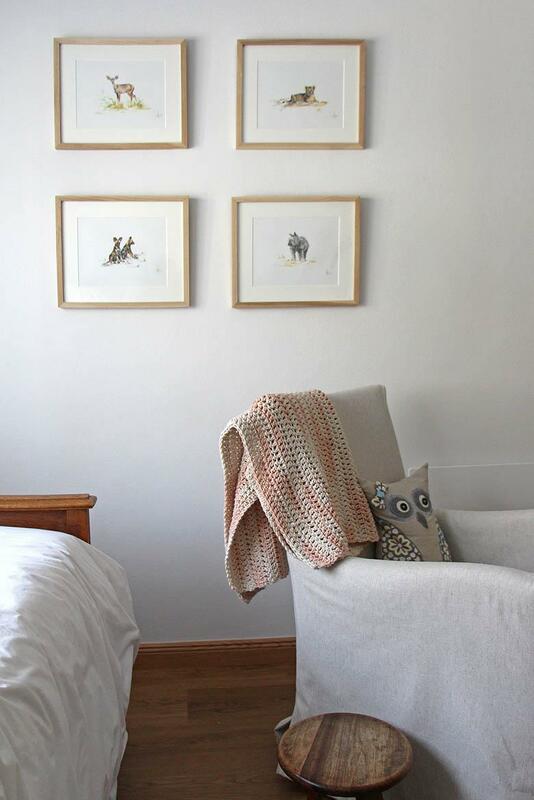 It is very different to what I at first envisaged: at one time I wanted an Beatrix Potter room, another a truely wildlife theme. Either way Jeremy and I agreed we did not want a smuthered in pink room for our little girl. Over time I let the idea of a theme go as I got gifts of all sorts and found a way of making it all fit together. The room is now perfect and I think that this is because in it lies my perfect baby more than it is about anything that goes in the room. Although with all the stories behind everything inside the room it is hard not to feel completely surrounded by love. 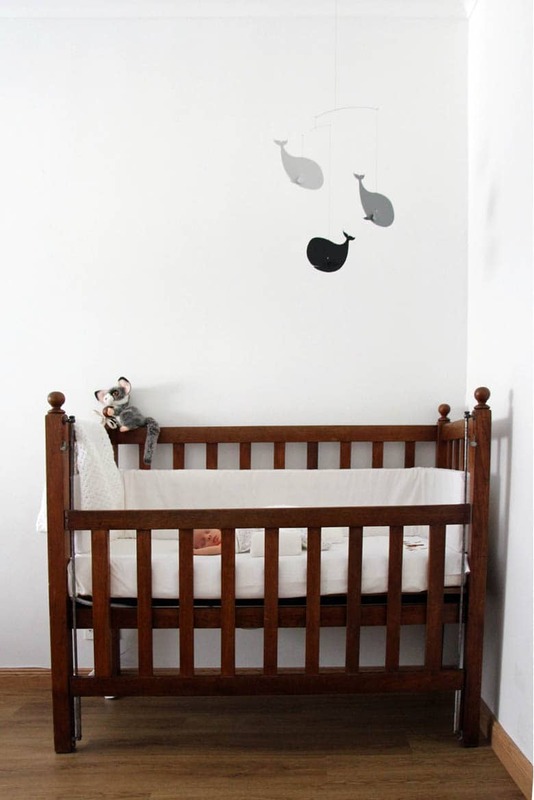 This entry was posted in Blog and tagged baby, baby room, DIY, einadesign hook, flenstedt mobiles, nursery, old meets new. It’s a beautiful room. Congratulations on the arrival of your little girl. The room looks GREAt! And r.e.s.p.e.c.t. for the patience of Jeremy:-) Pregnant women are hard to understand hahahaha.